Fall’s cooler weather spurs a taste for comfort foods, as well as a return to baked desserts. This seasonal sweet, studded with butterscotch morsels, is a tasty alternative to pumpkin pie. And talk about your versatile dishes: It was even better the next morning for breakfast, warmed in the toaster oven and topped with a dollop of whipped cream. What better way to start your day? Preheat oven to 350 degrees. Grease 9-by-13-inch baking dish. Spread bread cubes in single layer on rimmed baking sheets. Bake, tossing occasionally, for 10 minutes or until dry. Beat eggs in large bowl; stir in evaporated milk, pumpkin, 1 cup granulated sugar, vanilla extract, 1 teaspoon cinnamon and 1/2 teaspoon salt. Add bread; toss gently to coat. Transfer mixture into prepared baking dish. Let stand for 30 minutes or until bread is thoroughly saturated (press down on bread occasionally). Combine brown sugar with remaining 1 tablespoon granulated sugar and remaining 1/4 teaspoon cinnamon. Sprinkle butterscotch morsels over bread mixture; top with brown sugar mixture. Bake for 45 to 55 minutes, or until knife inserted in center comes out clean. Cool on wire rack for 30 minutes (this will allow bread pudding to set). Serve warm with ice cream. GENEVA, Ohio — Nothing announces to the world that you’re on vacation like a nice glass of chardonnay at 2 p.m. on a Thursday. 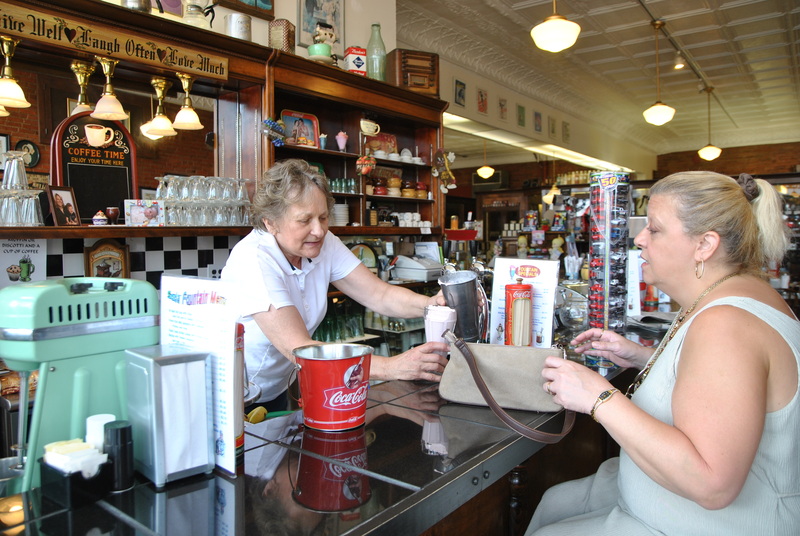 When you love ice cream as much as I do, though, a midday sundae also can hit the spot when you’re exploring a new city, which is how we ended up in Rees’ Corner Store in this quaint Ohio town just a few miles from Lake Erie. Hot on the trail of Ashtabula County’s hottest tourist attraction — the new West Liberty Bridge, which at 18 feet is the shortest covered bridge in the nation — we’d been inching our way down the main drag when we caught sight of the former pharmacy on South Broadway. 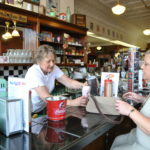 Charmed as much by the eclectic display of nautical tchotchkes, antiques and kids’ toys in the front window as by the giant mural advertising 25-cent sodas on a side wall, my husband and I had ventured in, only to be energetically greeted by Pat Green at the soda fountain. Jerks — so named because of the way they had to “jerk” levers behind the counter to hand-pump soda and syrup into ice cream to make ice cream sodas — have been quenching people’s thirsts at this counter since at least 1938. But it’s hard to imagine any doing it with as much gusto as Ms. Green, a Geneva native who loved the store so much as a child that nearly a half-century later, she came out of retirement to run it. An even bigger blast from the past is the pharmaceutical museum at the rear of the store, which includes everything from Thomas “Doc” Rees’ desk (when he died at age 100 in 1990, he was Ohio’s oldest living practicing pharmacist ) to a collection of flavored cough syrups and other medicines, aspirin boxes and pill containers. “The Rees family was always so good to the town, we wanted to honor them,” she explained. Ashtabula County has long been a popular destination for summer vacationers, thanks to 30 miles of shoreline along Lake Erie. Yet beaches (four) and marinas (nine) aren’t the only attractions. 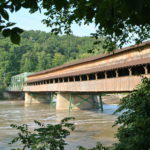 As we can attest, history buffs also head to this corner of Ohio to explore its many covered bridges: 18 in all, now that students from Ashtabula County Joint Vocational School have completed construction of the West Liberty structure. The covered passages are so beloved the county each year throws a party in their honor. This year’s 28th annual Ashtabula County Covered Bridge Festival (www.coveredbridgefestival.org) runs Oct. 8 and 9 at the county fairgrounds in Jefferson, and includes food and entertainment along with a scarecrow contest, quilt show, parade and antique car display. The timing couldn’t be more perfect, because early October is when the fall leaves are expected to be at their peak color (www.dnr.state.oh.us/tabid/9584/default.aspx), and many of its bridges — several of which date from the 1860s — are nestled prettily amid mature oaks and maples. Plan it just right (self-guided tour brochures are available at the fairgrounds and area lodging) and in one afternoon you’ll be able to hit at least a half-dozen. The Smolen-Gulf Bridge on State Road in Ashtabula Township, just a few miles south of the harbor town of Ashtabula on Route 11, has the honor of being the nation’s longest covered bridge. Dedicated in 2008, it stretches a whopping 613 feet across the Ashtabula River, and walking across it is a thrill, especially if you’re afraid of heights (it’s 93 feet above the water). We weren’t as taken with the county’s newest bridge, a passageway so humble that we drove by it at least three times without even realizing it. When my husband ran into the Unionville Post Office to ask for directions, the lady behind the counter looked at him as if he were crazy. A few minutes later, we were standing in front of a bridge that took just nine steps to cross. I’ve seen toll booths on the turnpike that were longer. Still, you have to admire the back story. Designed by the same guy who drew the plans for the record-breaking Smolen-Gulf, it was built from locally grown (and donated) red oak, maple and poplar. 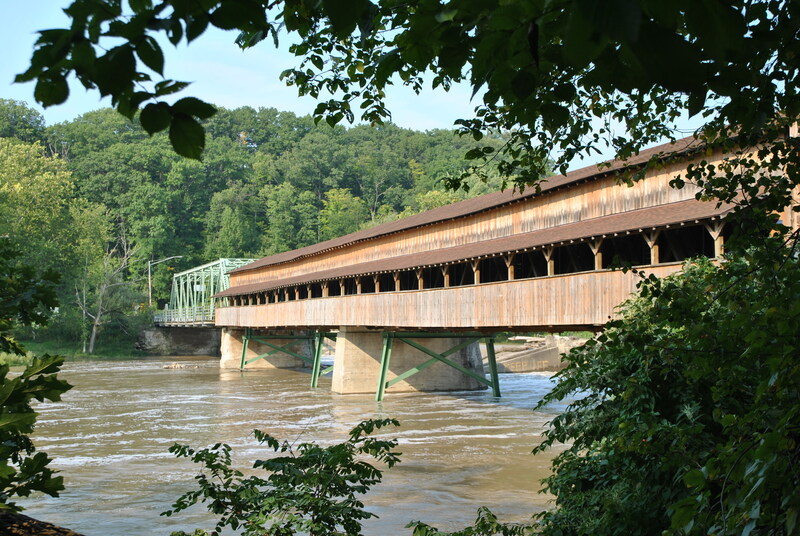 Our favorite was the Harpersfield covered bridge in Harpersfield Township. An artifact of a more simple time, it’s a picturesque wooden structure built in 1868 that’s listed on the National Register of Historic Places. It spans the Grand River, where fishermen angle for trout. Rather get your thrills tasting your way through a selection of reds or whites? Autumn also is when Ashtabula County’s grape harvest is in full swing at the vineyards along the shores of Lake Erie. Many don’t realize it, but wine has been cultivated in northeastern Ohio since the early 19th century, and today is one of the region’s biggest draws. More than 60 percent of the state’s grapes, in fact, are grown in the Grand River Valley in the state’s northeast corner, where a unique micro-climate protects the fragile fruit in the spring and then helps it grow well into the fall. The Lake Erie “Vines and Wines Trail” (www.ohiowines.org, 1-800-227-6972) offers a taste of award-winning chardonnays, rieslings, merlots and cabernet sauvignons at 20 wineries, within 10 miles of terrain. They range from the estate-like Ferrante Winery in Geneva ($6 for a tasting of six whites and five reds) to the waterfront Lakehouse Inn & Winery in Geneva-on-the-Lake, to countryside boutique operations such as Harpersfield Vineyard, also in Geneva, which boasts a 6-foot-tall wood-burning fireplace in its Olde World tasting room. 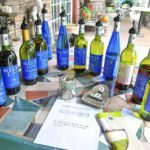 We tried all of the above during our 36-hour visit, plus a pair of Conneaut wineries: Buccia Vineyards, where samples cost 25 cents and an outdoor tasting room sits under a grape-covered arbor, and Markko Vineyard, founded in 1968 and one of the first Ohio wineries to seriously try its hand at European vinifera grapes. Given that pedigree, and the fact that all of its wines are estate bottled, the large stone pillars at Markko’s entrance seem in keeping. Yet the winery itself is nestled unpretentiously in the woods, in a rustic wood building that seemed primed for a makeover. A litter of sleeping “Markko sheepdog” puppies greeted us at the door. The Old Mill Winery in Geneva, conversely, doesn’t feel like a winery at all, but instead like a really fun college bar, with dark lighting, plenty of noise and dozens of old license plates nailed to the walls. No wonder one of its most popular sellers is the Grindstone Pink, a sweet wine made from a blend of Catawba grapes that are best suited for sangria. In other words, there’s something for every taste in Ashtabula County. We even found some pretty good shopping on Bridge Street in Ashtabula’s historic harbor district: sea glass bracelets for our daughters at Sandpiper Studio, freshly roasted Java Jampit coffee beans at Harbor Perk, a silver bottle opener in the shape of a fat baby bird at Defina’s. Then, on our way out of town, we caught one of our best road-trip lunches ever at the roadside White Turkey Drive-In on Route 20 in Conneaut. Alas, it closed for the season on Labor Day and won’t reopen until Mother’s Day weekend 2012. Just one more reason to come back. Getting there: Ashtabula County is along Lake Erie and the Pennsylvania border in northeastern Ohio. It’s about a 21/2-hour drive from Pittsburgh (Interstate 76 West toward Youngstown, then Interstate 11 North toward Ashtabula). Communities worth visiting include Geneva, Geneva-on-the-Lake, Ashtabula/Ashtabula Harbor and Conneaut. Where to stay: Among the county’s loveliest properties is the waterfront Lakehouse Inn & Winery in Geneva-on-the-Lake (www.thelakehouseinn.com, 1-440-466-8668). Nestled on two acres, with several terraces and a tasting room overlooking Lake Erie, it features an eight-room bed-and-breakfast and four cottages; fall rates start at $125 midweek/$135 weekends. Also worth a visit is the pet-friendly Lodge & Conference Center at GOTL ($99 and up, thelodgeatgeneva.com, 1-800-801-9982) and the Polly Harper Inn in Geneva, an intimate B&B nestled in a vineyard ($110 and up, www.pollyharperinn.com, 1-440-466-6183). Other options include chain hotels, cottages, mom-and-pop motels and campgrounds. Ashtabula County also boasts a variety of bed-and-breakfasts. Herb Garden School of Cooking and B&B in Jefferson caters to would-be cooks with culinary classes on select Thursdays evenings ($30) in its renovated 1848 farmhouse (www.hgschoolofcooking.com, 1-440-294-2555). 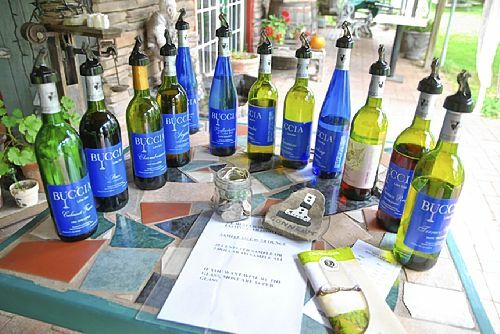 Buccia Vineyards and B&B in Conneaut is a blast from the past, with a six-person hot tub in each of its four rooms (www.bucciavineyard.com, 1-440-593-5976). Where to dine: Some of the best eats are plated at local wineries: the Lake Erie perch and grilled steak at Crosswinds Grille at the Lakehouse Inn in GOTL; the Italian specialties at Ferrante Winery & Restaurant in Geneva; the Cheddar Swiss fondue, served in a bread bowl with apple slices, at Grand River Cellars, also in Geneva. Terrific pizza and subs can be found at Covered Bridge Pizza Parlor (three locations). For pub fare, try Old Mill Winery in Geneva; the burgers are made with wine marinade. What to do: The county’s main attraction — and subject of an annual fall festival — is its 18 covered bridges, which include both the nation’s shortest (West Liberty) and its longest (Smolen-Gulf). The area’s developing wine scene is another big draw. The Grand River Valley growing region (located in portions of Lake, Ashtabula and Geauga counties) accounts for 60 percent of all grapes grown in Ohio; you can visit more than 20 wineries and vineyards. This year’s 49th annual Grape Jamboree runs Sept. 24-25 in downtown Geneva, with parades, wine tasting, a pie-eating contest and grape stomping (sign up at grapejamboree.com). For those who’d rather not drink and drive, The Lodge at Geneva-on-the-Lake offers a wine shuttle to four local wineries/vineyards on weekends ($15/person). Another option is the Wine Taxi (www.ohiovinetours.com); prices start at $37/person or $49 with lunch. With 30 miles of shoreline, Ashtabula County also is a wonderful jumping off point for exploring Lake Erie. September marks the beginning of the famed steelhead (a strain of rainbow trout) season, so anglers may want to squeeze in a full- or half-day fishing trip through a local fishing charter or marina; walleye and perch also are plentiful in Lake Erie’s temperate waters. A one-day fishing license costs $11 (ohiodnr.com), and if you remember to bring a cooler, you can carry your catch home. There’s also biking and hiking on the Western Reserve Greenway, a paved, mostly rural rail-trail that cuts a north-south course from Ashtabula to Warren, Ohio. Or take a ride through farm country on the AC&J Scenic Train Line (www.familytrainrides.com, 1-440-576-6346). The Kids Pumpkin Train departs from the village of Jefferson at 1 and 3 p.m. on Saturdays and Sundays in October, and includes popcorn and a visit to a pumpkin patch. Adults $13, seniors $11, children 3 to 12 $10; no reservations necessary. If history’s more your thing, stop by Olin’s Museum of Covered Bridges in Ashtabula (1 to 5 p.m. Wednesdays and weekends through October, www.coveredbridgemuseum.com; 1-440-998-0025) or the Ashtabula Maritime Museum (noon to 5 p.m. weekends through Sept., 1-440-964-6847). The offbeat “One and Only” Presidential Museum in Williamsfield (11 a.m.-7 p.m. Thurs.-Sun, 1-440-344-0523) bills itself as the only museum to display artifacts from “all 52 presidents,” including the eight who preceded George Washington. Or so argues founder/curator Nick Pahys. More info: www.visitashtabulacounty.com or 1-800-337-6746. Where do I begin to tell you about how I roasted a pig? With the torrential rainstorm that threatened to douse the party I’d spent weeks planning, pummeling my backyard (and children) with so much water that my hair was still wet five hours later? r the fact that the power went out at exactly the moment I started cooking the barbecue sauce? Honestly, what was most unnerving about our first annual PG Pig Roast was the pig. 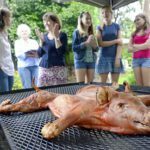 Until we picked the 61-pounder up from Thoma’s Meat Market in Saxonburg, cooking a whole hog was very much an abstract idea, something to joke about. “Who’s gonna eat the eyeballs?” we teased the kids. Should we stuff an apple in its mouth? Think the trash guys will notice the head in the garbage can? Watching the butcher pull the plastic-wrapped animal out of the cooler and load it with a grill onto our U-haul trailer, its red-tipped trotters sticking out of the folds like something on “Dexter,”was sobering. Suddenly there was no denying we were about to cook something that had just been grazing and rooting. Tougher still was prepping the pig for the charcoal. I understood the carcass had been scalded and carefully scraped clean of hair, then slit along the backbone so it would lay flat on the grill. Still, I was ill-prepared for the smooth, bloodless-white skin and the long slice up the animal’s belly. Even less so for the purple-red tongue, cut out of its mouth and hanging under its freckled snout like a glob of liver. When I caught sight of its baby blues, I screamed. When I ordered the pig at the beginning of August (most butcher shops require at least a week’s notice), I’d asked Brian Thoma if it had to come with its head. Well, no, he answered, clearly amused (or perhaps puzzled is a better description — wasn’t I a food writer?). “But that kind of takes away from it. “Believe me, people will want the jowls and probably try the ears,” he added. A brave few, he said, might even want to sample the eyes. So what was I supposed to do with the head after the roast? “Put it on a stick like ‘Lord of the Flies’ and freak out your neighbors?” suggested one Facebook friend. Big Burrito executive chef Bill Fuller, who directed me to Mr. Thoma and served as Pig Roast Consultant in the days leading up to the event, had the best answer: “Have Peter deal with it. Duh.” Isn’t that what husbands are for? Thanks to the directions from Thoma, roasting the pig was a breeze. Well, at least until the rainstorm hit. Terrified the charcoal would be extinguished, I dragged my three kids outside to help me hold a giant tarp over the grill. In a lightning storm. In hindsight that was a pretty stupid idea. At the time, though, all that was running through my head was the fact I’d paid $2.69 a pound for the pig, plus another $40 to rent the grill. You can’t cancel a pig roast. Two hours later it was still pouring, but by then my husband was sloshing through the puddles with me in his suit pants, trying his best to hammer together a makeshift lean-to out of a stack of 2-by-4s. Eventually, a neighbor brought over a portable canopy along with a generator. We didn’t need it for long: within the hour, the sun was breaking through the clouds and the first guests arrived with a beautiful array of potluck salads, sides and desserts. Time to get this party started! Cooks have been roasting whole pigs for thousands of years. But in the U.S., it’s only been in the last few decades that it’s become mainstream enough that regular Joes are hosting roasts in their backyards. They’re most popular in warm weather, starting in May with graduations and continuing through summer and fall at picnics, vacations and campouts, said Tom Friday, owner of Tom Friday’s Market in Brighton Heights, one of several local butcher shops that provides whole pigs for roasts. You also can roast a pig in the cold of winter if the grill’s sheltered, which is why deer hunters also are regular customers. 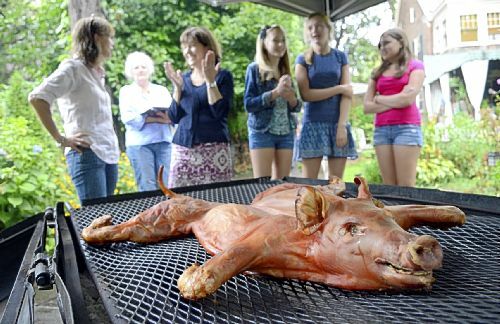 Even without the rain, I knew the process wouldn’t be pretty (search Google images for “pig roast” and you’ll see what I mean.) But would it really be as easy as putting a roast in the oven, as my butcher insisted? And indeed, all we had to do, once the charcoal was white-hot, was lay the pig belly down on the grill and close the lid. A little over five hours later, we were noshing on the yummiest, most succulent nose-to-tail dish you can imagine. Many who buy a whole pig (they’re typically frozen) thaw it themselves over a drain in the garage, but I didn’t want that responsibility or mess; we picked it up on the day of the roast already defrosted. Seeing most people pass on the cooked skin (it’s like leather) it’s also not necessary to shave off any stray hairs missed at the butcher shop before roasting, as Chef Fuller instructed. While pigs easily can tip the scale at 100 pounds or more, the most popular size is around 80 pounds — more than enough meat to feed around 50 people and still have leftovers. Some dig a pit or cook the pig on a spit, but I took the easy route and rented a charcoal grill from Mr. Thoma. Crafted from a 250-gallon oil drum, it took a forklift to lift it onto our U-haul trailer at the store and four strong men to get it back off again in our driveway. Some like to cut slits in the skin and stuff it with a little garlic or rosemary, or season the entire body with salt and pepper, but it’s really not necessary. Absolutely essential is walking away after you close the lid. Each peek adds 15 minutes to the cooking time, and it really is impossible to go wrong if you follow the program: six hours for 80 to 100 pounds, seven hours for 100 to 125 pounds and eight to nine hours for a 150-pounder. When it’s done, the internal temperature should read 170 degrees in the shoulder and hindquarters. The most dramatic way to serve the pig, Mr. Thoma told me, is right off the grill. And to be sure, one hungry couple used their fingers to stuff the tender rib meat directly into their mouths. But that’s messy and besides, I wanted the cooked pieces on my kitchen table, where it’d be easy to pull the meat from the bones with my fingers for sandwiches and tacos. No problem: all it took to hack it into quarters was a sharp chef’s knife. To my delight, a cheer went up when I lifted the first golden-brown section off the grates and onto a tray. A few minutes later, a giant platter of it lay shredded on the buffet table, with a bowl of homemade barbecue sauce. The crowed quickly dug in. “This is sooo good,” more than one guest exclaimed. Plates were loaded with seconds, and thirds. A few friends asked to take home leftovers. Our big mistake was not cleaning the grill while it was still hot with a bucket of soapy water and an old broom, as instructed. A day-and-a-half later, the solidified grease in its belly was full of bees and even a wire brush couldn’t scrape off the little bits of dried skin. We ended up having to light another fire to cook it off. The smell that filled our backyard was so delicious that within minutes, my son was off the couch and on the deck. “Hey, are we doing another pig?” he shouted. I didn’t actually see him licking his lips, but I wouldn’t have blamed him. Heat the oil and onion in a medium saucepan over medium-high heat until onion starts to sizzle steadily, about 1 minute. Reduce the heat to medium, sprinkle generously with salt and pepper, and cook, stirring, until the onion becomes translucent, about 4 more minutes. Sprinkle the chipotle powder on top and cook stirring until it becomes fragrant, about 30 seconds. Stir in the remaining ingredients and simmer for 5 minutes, so the flavors mix and meld and the onion becomes tender. Using an immersion blender or by transferring sauce to a blender, puree until smooth. It will last in the refrigerator for up to 5 days. These stovetop beans couldn’t be easier, especially since I didn’t make the bacon cups (too many people, too little time); I served them right out of the pot. Pour the honey into a small saucepan and bring to a simmer over medium heat. Turn off the heat and add the habanero and allow the honey to cool to room temperature. Strain through a fine-mesh sieve into an airtight container. For the beans: Heat the olive oil in a medium pot over medium heat. Add the onions and cook until translucent, about 3 minutes. Add the beans, brown sugar, bacon, wine, cilantro, molasses and chili powder and 1 tablespoon of the habanero honey and salt. Stir to combine and bring to a simmer over medium heat. Reduce the heat to medium-low and simmer gently until the mixture is reduced by half, about 20 minutes. Turn off heat and set aside to cool to room temperature. For the bacon cups: Preheat oven to 350 degrees. Turn muffin pan upside down and spray the bottom with cooking spray. Criss-cross 3 slices bacon over the upturned cup and then put another mini-muffin pan on top so bacon is compressed between the 2 pans. Place the pans on baking sheets and bake until bacon cups are crisp and brown, about 20 minutes. Remove the baking sheet from the oven and set aside to cool completely. Lift up the top tin, carefully remove bacon cups and place on a paper towel to drain, wrong side up. To serve: Gently reheat the beans over medium heat until warmed through. (Add 1 tablespoon water if they are too thick or dry.) Place a spoonful of beans into each bacon cup. Top with a dot of sour cream, some chopped pepper and scallion rings. Both beans and bacon cups can be made 3 days in advance. Refrigerate beans in an airtight container and store bacon cups in airtight container at room temperature. Don’t rewarm the bacon cups before serving or they’ll go soft. Mix cooked potato and minced onion together in a large bowl. Melt 8 tablespoons butter, and add to bowl, tossing well. Mix chicken soup and sour cream in a small bowl. Add to potatoes and stir to combine. Add cheddar and garlic, mix well and season with salt and pepper. Spoon into a large baking pan. Melt remaining 4 tablespoons butter. Spread a layer of corn flakes on top of the potatoes. Drizzle with melted butter. Bake in a 350-degree oven for 45 minutes. To make dressing: Whisk together first three ingredients, season well with salt and pepper, and then add the habanero and let its heat permeate as you make the slaw. To make slaw: Peel the pineapple and slice into inch-thick rounds. (Leave the core in.) Brush 4 slices (if there’s extra, reserve it for another use) lightly with oil and cook on a very hot grill until there’s good char on both sides of the rounds but the fruit hasn’t fallen apart at all, about 3 or 4 minutes per side. When cool enough, cube the pineapple and set aside until completely cooled. Not long before serving, remove and discard the habanero from the dressing, then toss together the slaw ingredients with the dressing. Season with salt. Taste for salt, acid and sweetness. The slaw will hold well for a couple of hours. Bring broth to boil; stir in orzo. Cover tightly and cook for 7 minutes. Drain orzo and transfer to large bowl to cool. Toss orzo with beans, tomatoes, onion, basil, mint and vinaigrette to coat. Season to taste with salt and pepper. Combine ingredients in a jar or bowl, and whisk to combine. Combine nuts, mint, parsley, 3 cloves garlic, 2 tablespoons oil and feta in a bowl. Cover and refrigerate overnight. Sauce carrots, leeks, remaining 3 cloves garlic in a pan with 1 tablespoon oil until tender. Grind cumin and coriander and add to pan with ginger. Sauce 3 minutes, add lentils and cook until warm. Whisk vinegar with remaining oil, and toss with lentils. Season with salt and pepper. Garnish with feta and pine nuts. Trim zucchini and squash, cut lengthwise into long strips, then cut in 1/4-inch dice. Peel and seed cucumbers, then cut into 1/4-inch dice. Place squash and cucumbers in a large mixing bowl. Add vinegar and toss to combine. Let marinate 45 minutes at room temperature. Meanwhile, combine onions, tomatoes, bell peppers and cilantro in another large bowl. Drain squash mixture. Add to onion mixture and toss to combine. Dress salad with olive oil, salt and pepper. Taste and add more vinegar if needed. Refrigerate at least 2 hours before serving.